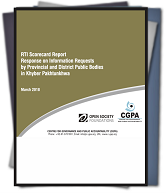 PESHAWAR: The Centre for Governance and Public Accountability (CGPA) has thrown weight behind the decision to amend the Khyber-Pakhtunkhwa Right to Information Act 2013. This was stated in a press release on Wednesday. According to the document, CGPA said RTI Commission has proposed requisite changes to the law which ought to be implemented. “Under these recommendations, the K-P Assembly and Peshawar High Court will be included within the ambit of the RTI Act,” read the statement. Other proposals included making PHC the appeal court for the commission’s decisions and appointing a new commissioner within 30 days if the position falls vacant, it added. According to the press release, Anwar also backed the commission’s plans to make PHC the appeal court for its decisions. In June 2015, Minister for Information Mushtaq Ghani exempted the K-P Assembly from the purview of the RTI legislation through an amendment presented in the house. The final version of the bill, which was put to the vote, was not provided to anybody and last-minute additions were made to grant the exemption. CGPA condemned the move, saying the manner in which the amendment was introduced violates the accepted norms of lawmaking and cripples the legislative process. Published in The Express Tribune, August 13th, 2015.